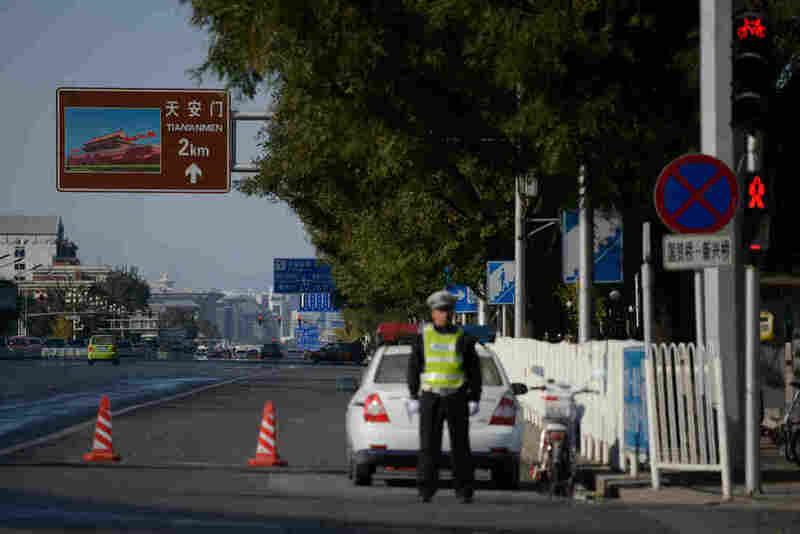 Police Seek Suspects In Tiananmen Car Crash : The Two-Way While the government isn't saying much, the crash may be tied to a restive area of China. Authorities have not classified the crash, which killed five and injured dozens, as an attack. A police officer stands on an avenue outside Tiananmen Square in Beijing, on Tuesday. On Monday, a car crashed into Beijing's Tiananmen Square. The Guardian reports that police said the vehicle "burst into flames" after crashing into a guardrail, leaving five dead and 38 people injured. As you might expect, the square — the site of China's 1989 pro-democracy protests — is full of security, so it wasn't long before authorities clamped down on coverage. Today, we're getting news that Chinese authorities put out an alert seeking information on two people from Xinjiang province. This is significant, reports the BBC, because the area has been the scene of violence for years. "One man is from Lukun in Shanshan county, where around 30 people died in June this year. A BBC team were prevented from reaching the scene. The second 'suspect' is from Pishan county where seven 'terrorists' were shot dead by police in 2011. "There have been many more violent incidents and dozens of deaths across Xinjiang in the past five years. Often these have involved clashes between Uighurs and local police, government and security personnel. "Authorities usually blame 'separatists' and 'terrorists' who they say are inspired, funded and trained from abroad. But in many areas there are significant local grievances among Uighur Muslims who resent restrictive measures directed at their religious and cultural practices." The implication, of course, is that the car crash was no accident, but instead could have been a planned attack. "Witness accounts suggested the driver had deliberately steered the vehicle more than 400 yards along the sidewalk and had rammed into a marble railing of the Jinshui Bridge, built to traverse the moat that encircles the vast imperial residence that served generations of Chinese rulers.
" 'This was not some driver who took a wrong turn and accidentally ended up on the sidewalk,' one witness said. "Southern Metropolis Daily, a newspaper based in Guangdong, quoted a Filipino tourist as saying the driver had repeatedly honked the car's horn, suggesting an attempt to alert pedestrians." Xinhua, the official English-language news agency of the Chinese government, doesn't add much detail to the incident, except to say "further investigation is under way."